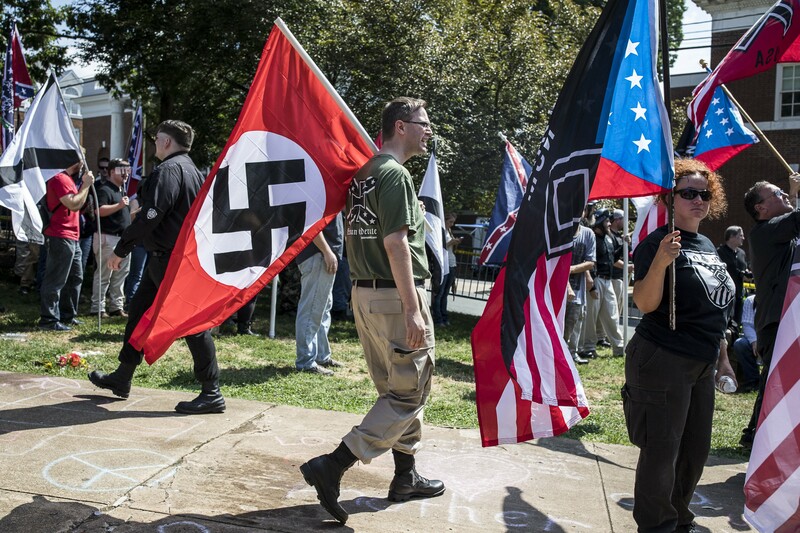 A white nationalist carries a Nazi flag during a protest in Charlottesville, Va., Aug. 12, 2017. The White House, under siege over President Trump’s initial comments, on Sunday condemned “white supremacists” for inciting violence that left a woman dead Saturday. BRIDGEWATER, N.J. — White House officials, under siege over President Donald Trump’s reluctance to condemn white supremacists for the weekend’s bloody rallies in Charlottesville, Virginia, tried to clarify his comments Sunday, as critics in both parties intensified demands that he adopt a stronger, more unifying message. A statement Sunday — issued more than 36 hours after the protests began — condemned “white supremacists” for the violence that led to one death. It came in an email sent to reporters in the president’s traveling press pool, and was attributed to an unnamed representative. The email was sent “in response” to questions about Trump’s remarks, in which he blamed the unrest “on many sides” while speaking Saturday before an event for military veterans at his golf resort in Bedminster, New Jersey, where the president is on vacation. Trump’s reluctance to speak out with force and moral indignation against the white nationalists who incited the most serious racial incident of his presidency elicited deep feelings of disappointment spanning the ideological spectrum. “I think what you saw here was a real moment in our nation for our leaders to deal with this moral issue as one country, as people all over the world watched,” said Gov. Terry McAuliffe of Virginia. Trump’s “words were not — not — what this nation needs,” said McAuliffe, a Democrat. Gov. John Kasich of Ohio, a Republican and a frequent critic of Trump, cautioned against reading too much into the president’s initial response but called for the White House to use the incident as an opportunity to convene “a national discussion” on race, prejudice and community policing. Trump will continue to receive regular updates from his team, according to the official to whom the statement was attributed, and Thomas P. Bossert, White House Homeland Security adviser, was in Bedminster monitoring the situation.